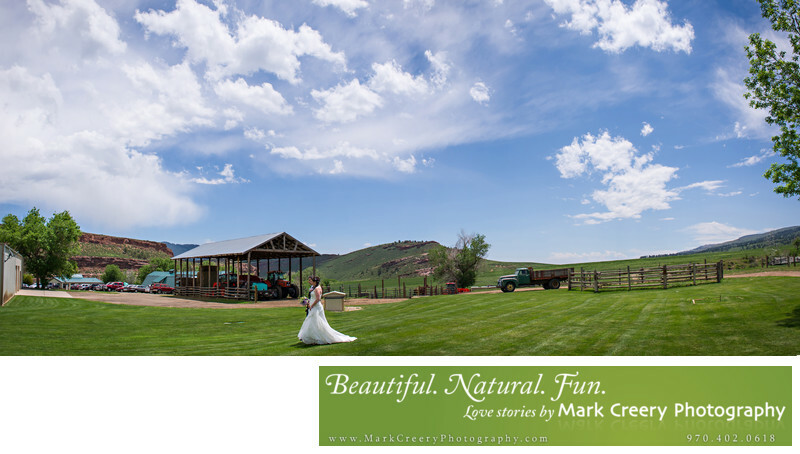 When I photographed this wedding at McC Ranch in Masonville it reminded me of the beauty that lies just tucked away from the Front Range. When you're at the ranch it feels like you're miles away from civilization and you get the true ranch feel that make these kinds of venues so popular for weddings these days. It is nestled between the hogbacks of the foothills with sweeping panoramic views all around. There are several barns and pastures all around, with a pasture of lush green grass (in summer) that pops off the Colorado blue skies. It's these colors unique to this area that I try to capture when telling the story through my lens of the landscape where the wedding is happening. In this image, the couple was walking across the pasture having a personal moment together. To me the scene needed to be shown in all its' panoramic beauty. To do this I take multiple images and stitch them together carefully to produce a high resolution finished product that can become a beautiful art piece on their wall. These artistic touches are part of what distinguish me from other photographers in the area, and I think speaks to what Colorado couples are looking for in their photos. McC Ranch is located in Masonville, Colorado (near Loveland). Contact: (970) 667-8514 or (970) 667-7459. Location: 12425 N County Rd 27, Loveland, CO 80538, Buckhorn Road.